We have been tossing around the idea of getting a Brother Dream Machine for about a year now. I mean, who wouldn’t want one of these? This is an absolutely awesome machine and the features on it are just amazing. Every now and then, we would find a video on YouTube promoting some of its features and ooh and ahh over the wonder of it all. We were so excited when it finally arrived and we were dying to open it all up and have a play, but we wanted to record an unboxing video first. That was hard as it was like having all your presents sitting in front of you on Christmas Day but you can’t open them until after breakfast or something….aarrghh! Anyway, we managed to get the unboxing video done and here it is. Is this good for a beginner? Yes Dawn, a beginner sewer can certainly use this machine. It’s really a consideration of whether or not a beginner would want to go to the expense of a machine like this. 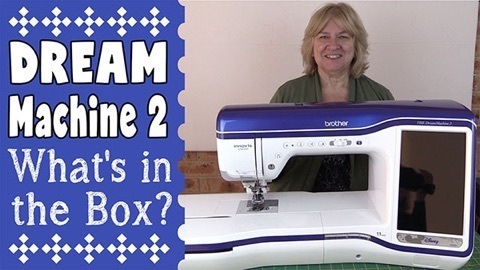 It sometimes pays to start out with an inexpensive machine to see if you really like sewing, quilting and embroidery, and when you decide ‘yes’ I love it, then upgrade. I do have to say that it is a fabulous machine and I am so glad we bought it.